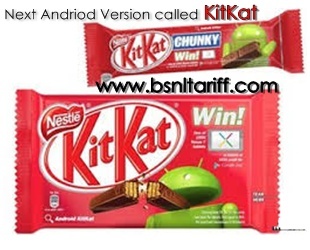 For-powering mobile devices Google has announced that next Android version software will be named as ‘KitKat’ and each Android version is named after a dessert. The company planned to get more popularity to its new version software with easy technique after finding the public weakness towards chocolates giving Chocolate names to Android version. The company already listed Android software over the years includes Cupcake, Donut, Ice Cream Sandwich and Jelly Bean. Google is attractive people with giveaway KitKat candy bars featuring Android robot icons on wrappers and chances to win Android powered Nexus 7 tablets or credit at its online PlayStore. Android version software on all smartphones powered by Google improved its share market globally. Billion smartphones or tablets worldwide powers Google’s Android version software.